Lenders are going into bankruptcy and the sales market is disappearing, causing developers all over New York to face choices about how to ride out this down cycle. Over $400 billion in mortgages on commercial properties, including office towers and shopping malls, are to come due by the end of 2009. Even if these properties are performing well, they could go into foreclosure if mortgage holders are unable to pay off the loans. 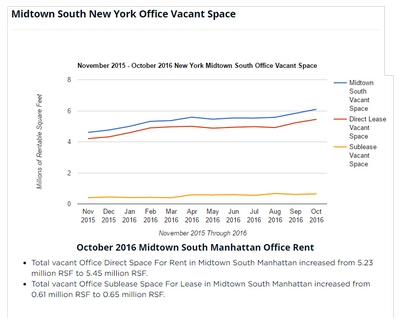 The commercial real estate market has shifted from property sales toward the purchase and sale of debt, where the loan, rather than the actual real estate, is on the market. One example is the $200 million mortgage for sale for the Drake Hotel site between Park and Madison avenues and 56th and 57th streets. Developer Harry Macklowe, who purchased the property nearly three years ago, defaulted on his loans, and bidders are now competing for the mortgage note. 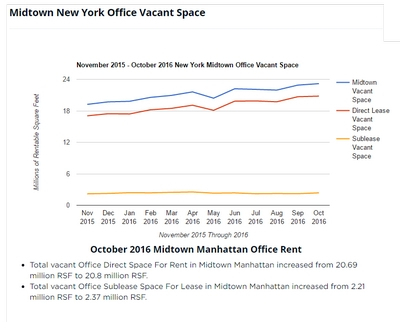 Two projects purchased by Lev Leviev, the Apthorp, an apartment building at 390 West End Avenue, and the old New York Times headquarters at 229 West 43rd Street are now struggling. The Apthorp is in danger of defaulting and only one unit has sold in the last six months. The former Times building remains mostly unleased. 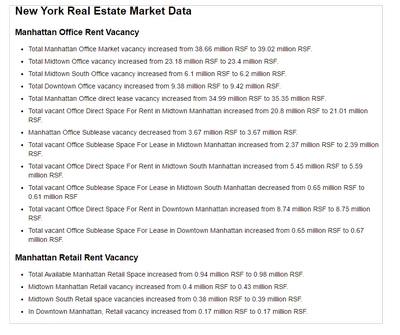 New York City property taxes are going up. The tax rate will increase 7.5 percent, not the reported 7 percent, to make up for Mayor Bloomberg's previous decrease in the tax rates. All types of properties will see a tax increase, except for Class 4 commercial properties, which will see a small decrease. New York construction unions are looking into starting a fund that would help finance the real estate projects that employ union members. The unions may put $100 million of pension fund money into the real estate projects fund, and would also seek matching money from the city and state to create a total fund of $300 million. 148,000 stores have already closed this year, and that that number could soon reach 170,000. 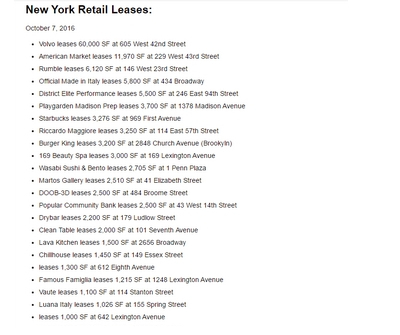 On the upside, as rents decline, stores may become affordable to smaller retailers that previously couldn't afford higher rents. The retail market is expected to turn up in 2010. 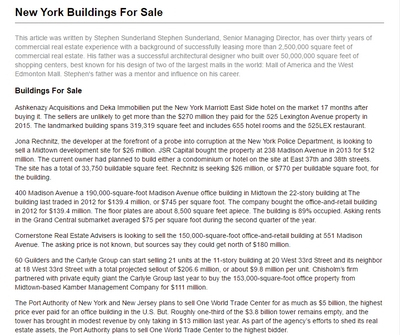 Citibank filed an $86 million lawsuit against Sheldon Solow for failing to pay back loans and letters of credit issued in 2004 to finance a development project along First Avenue, between 38th and 41st streets, where construction has not started. The land use committee of Brooklyn's Community Board 2 voted down Two Trees Management's proposed Dock Street development for a proposed 18-story building. Community Board 2 will make a final vote on the project on January 14 before the proposed plan is presented to the borough president's office as part of the ULURP process, the city's multi-phased, seven-month rezoning process. The land use committee voted in support of rezoning the site to only allow 75-foot-tall buildings in the area. The Hunts Point produce market is working with city and state officials to plan a new facility that could be built with federal economic stimulus funds. The market's 50 vendors have outgrown their 420,000-square-foot home at Halleck and Spofford streets in the South Bronx. Newark, NJ, has been trying to draw the Hunts Point market there. Each year, the 3.3 billion pounds of produce sold at the market generates $2 billion in revenue. As credit remains tight for the construction industry, building contractors in Manhattan are increasingly resorting to legal action to get compensated. 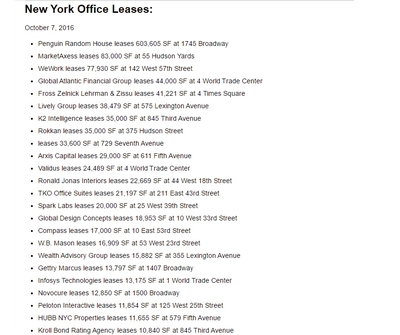 Building trades firms filed twice as many liens against Manhattan properties undergoing construction last month as they did during the same month in 2007. There were 398 mechanic's liens filed in November compared with 198 filed in November last year, according to the office of the county clerk for New York County. For the first time in at least four years, the average number of liens filed each month grew, after declining from 2005 to 2007. Through November this year, there was an average of 290 liens filed each month compared with an average of 221 per month in all of 2007; 243 in 2006; and 266 in 2005. Contractors are negotiating with their unions in order to lower labor costs by up to 25 percent as a way to help revive the city's weakening construction industry. Labor is about 50 to 60 percent of the cost of a construction job. Union unemployment could increase to 40 percent by the end of next year if costs aren't lowered. It costs over $400 per square foot to construct a high-rise office building in the city, compared to $150 per square foot in Atlanta and $180 per square foot in Chicago. The Bernard Madoff scandal has some implications on real estate in the city, which list Madoff investments as part of their net worth. Many of the Madoff investors were also silent investors in real estate, especially condo projects in the city. As loans and construction financing are difficult to obtain, developers are looking to silent investors for funding, and the money that these Madoff investors lost would have gone towards developments in the city. Madoff most likely fabricated many of the real estate trades on his hedge fund statements. Madoff was arrested last week on accusations of running a fraudulent investment company and losing $50 billion in investments. The City Council has approved the creation of the Fulton Street Business Improvement District, which will extend from Flatbush to Classon avenues. A year after the Metropolitan Transportation Authority announced it ran out of money to build the above-ground portion of the Fulton Transit Center in Lower Manhattan, the agency still has no decision about its future. There are a couple of options for what to build, but the problem is paying for it. The MTA is not interested in putting a commercial structure on top of the station to raise revenue. The Construction Financial Management Association's recent study of industry confidence shows that it has declined 18 percent since June. The study surveys 200 randomly selected CFOs in the commercial construction sector. The Empire State Development Corp. has decided to use eminent domain to give Columbia University the last two properties in the footprint of the university's West Harlem expansion plan. Columbia already owns most of the 17-acre expansion zone, and the last properties to be seized are owned by eminent domain opponent Nick Sprayregen and a family that runs a gas station. Both property owners will be compensated at market rate for their properties. 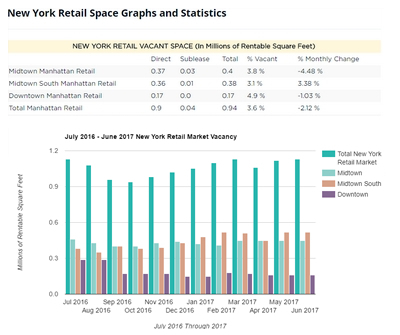 New York City hotel guests may be in for a break as after a number of record years, hotel occupancy levels and average daily room rates are falling and are no longer out-performing the prior year's record results. Fewer travelers -- business, domestic and European -- are visiting the Big Apple. The decreasing strength of the dollar versus the euro, the global credit crisis and a significant reduction in business travel, is resulting in this fall's overall drop in the number of travelers by at least 15 percent. Hotels are experiencing significant drops in occupancy since November. So for the first time in years, more than 25 hotels in Manhattan have already announced that in January they will be offering rooms at prices below $100 per night. 345 Park Avenue Deutsche Investment Management Americas, a unit of Deutsche Bank, has renewed its 150,000-square-foot space at 345 Park Avenue, between 51st and 52nd streets. The asking rent was not disclosed, but it is estimated to be more than $100 per square foot. The new Yankee Stadium and the new Mets stadium, CitiField, are at a combined cost of about $2.2 billion, and the city plans to issue an additional tax-exempt bond of $341.2 million to complete the stadiums. The teams are responsible for paying off the bonds, but are paying tens of millions of dollars less in interest because payments to bondholders are exempt from city, state and federal taxes. Mayor Michael Bloomberg has said that the city will earn a net return of $40 million over the bonds' life. 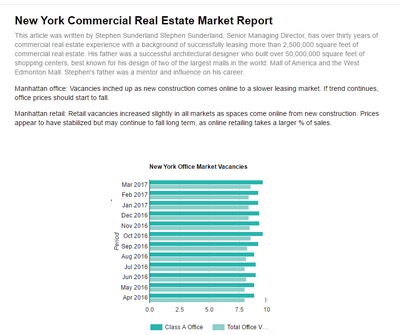 The credit crunch that has made it harder for developers to pay contractors and has led to a near-doubling of the number of mechanic's liens filed in New York City. 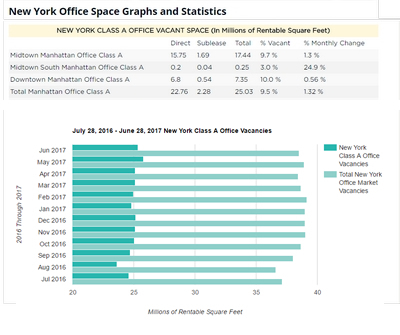 The tally of mechanic's liens increased from an average of 394 per month in 2006 to an average of about 769 over the past three months for construction projects in the five boroughs. The Port Authority received no bids for the bonds, and plans to try to sell them again next year. The Port Authority's $30 billion capital plan requires that it continually sell bonds to finance the construction of major projects, including the Freedom Tower. 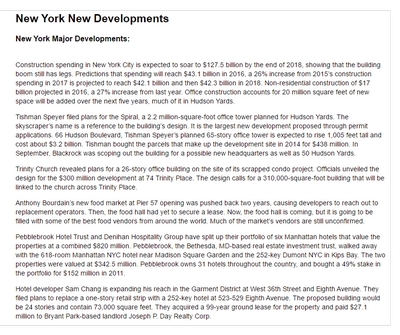 50 West Street Time Equities $600 million hotel and condominium project at 50 West Street could be delayed until 2012. The three developers vying for the right to develop Pier 57 will formally present their proposals to a group of community activists and government officials. The Related Companies, Youngwoo Associates and a joint venture between the Durst Organization and C&K Properties are all submitting proposals, and the chosen developer won't be announced until May. This is the second time in five years that the Hudson River Park Trust has sought a developer to turn the 357,000-square-foot pier, at the end of West 15th Street, into a retail and cultural center. Extell Development is planning to build a 1,000-foot tall hotel and condo tower at 151-161 West 57th Street, between Sixth and Seventh avenues. The hotel, ground-floor retail and a garage will take up 356,467 square feet of a total 882,141 square feet, which includes the condos. The building, which could be up to 80 stories tall, is designed to be LEED certified. The hotel will have a spa, pool, ballroom and meeting rooms. 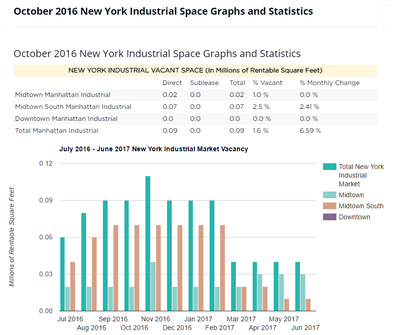 The number of demolition permits in New York City fell sharply in November compared to a year ago, indicating a continued construction slowdown in the five boroughs. 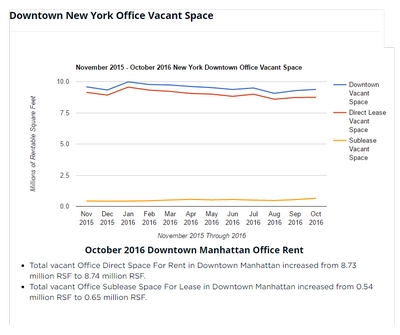 The city's Department of Buildings issued 72 initial demolition permits in November, 65 percent fewer than the 205 issued the same month a year ago, and a steep decline from the 164 issued in October. Demolition permits are considered an indicator of future development in the city. Tiffany's said they plan to cut back expansion plans and renegotiate store leases as the economic slowdown has cut into same-store sales. Tiffany & Co. plans to reduce the number of new store openings in 2009, as the jewelry retailer's same-store sales during the third quarter fell 14 percent in the U.S., and 6 percent in its nine New York stores. New York-based bookseller Barnes & Noble said it will cut the number of new store openings to 15 in 2009, from between 20 and 25. 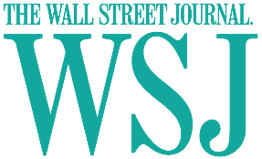 The chain said same-store sales fell 7.4 percent during the third quarter, compared with its prior forecast of a low single-digit decrease. The Jasper condo, at 114 East 32nd Street, is now returning deposits to buyers and turning the building into a boutique hotel. Just 43 of the 80 units were in contract. The developer has entered into agreement with a European investment fund to convert the 18-story building into a 200-room hotel expected to open in a year. The hotel plans will keep some of the condo's features, like the pool, floors, fixtures and most of the lobby.